Since creating the first Rhythm Bingo Printable I have had a great time playing the game with my group classes. The kids love playing bingo and it really challenges their listening skills. It is also a quick enough game that it doesn’t eat up a lot of time. We can play 2 or 3 short rounds pretty easily in a group class. The rhythms I used in the first printable were pretty basic: quarter, half, and whole notes, and quarter rests. 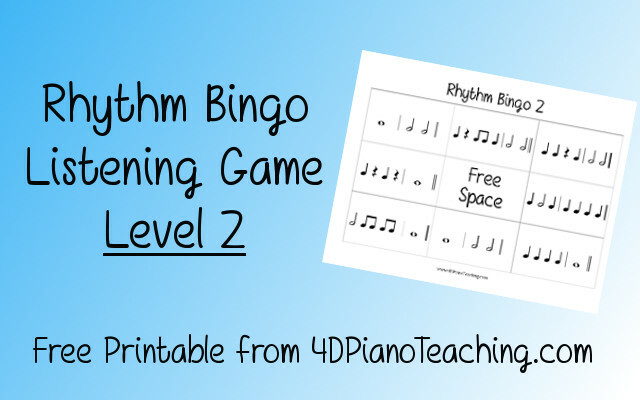 I’ve been wanting a to give my older group classes a little bit more of a challenge so I created Level 2 of Rhythm Bingo. Level 2 includes eighth notes and dotted-half notes in addition to the not values used in the first version. I added a small 2 to the corner of each “draw card” to help avoid any possible mix-ups between the two versions. Hopefully your group classes will love level 2 as much as mine have loved the first level! when printing, the notes come out represented as Qs, As, and Ws….bummed this did not work. Hmm, I’m not sure what’s happening Stephanie. Maybe make sure that you actually download the file and save it to your computer before printing instead of just printing from the preview in the web browser? If that doesn’t work let us know, we want to make sure you can use it! I would love to know what program you used to create this game? I would like to do even more advanced rhythms for my students. I would so appreciate having this information. Your website is fantastic by the way; so creative.